No, I did not have sense enough to move those hanging vinca vines out of the way when I took a picture of my gigantic Red Banana leaf. Thanks for noticing. This gigantic leaf is a new "personal best" for me in the "big leaf" category. It's my Red Banana, Ensete maurelii. 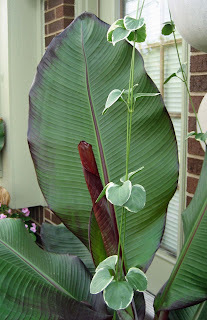 Normally, I would have planted elephant ears, Colocasia esculentum, in the pots where I planted these. But on impulse, I snatched up the banana plants instead, not realizing how big the leaves would get, or that it would lead to this personal best. This particular leaf is about 31 inches from top to bottom. And it's about 14 inches across. 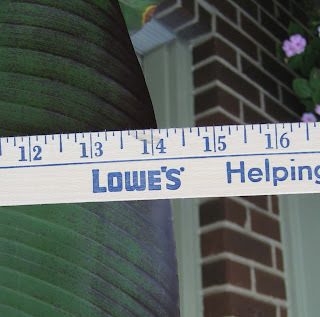 Yes, that picture is upside down, thanks for noticing, but that's how I had to turn it so the numbers on the yard stick would be right side up. It was a tough evening with the camera. This Red Banana isn't a native plant around here (you noticed that, too?) but I still think it counts as my personal best for big leaves. 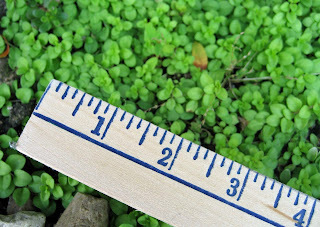 I've noticed that whenever I write about one of the earliest, latest, tiniest, ugliest, or whatever-est in my garden, people assume I'm competitive about my gardening. Not so! I just like to keep records of stuff like this. So, do you want to see one of the tiniest leaves in my garden? It's Veronica repens 'Sunshine' and it's in my miniature garden where I've placed all the smallest plants in my garden. If this isn't the tiniest leaf in my garden, it has to be pretty close to it. 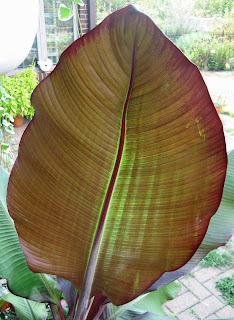 By the way, the red banana leaf also wins the prize for "reddest" leaf in the garden. 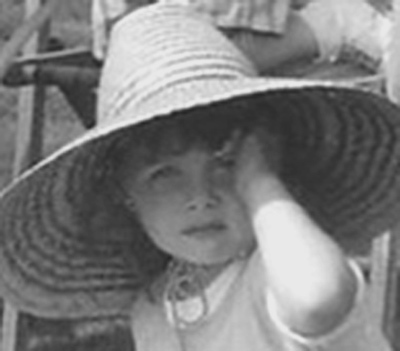 Any 'ests' in your garden? Yes, thanks for asking: deadest and ugliest. Those are the 'ests in my garden right now. LOL! I think my Rudbeckia were the happiest flowers in my garden. They are now just a happy memory! This is inspirational. 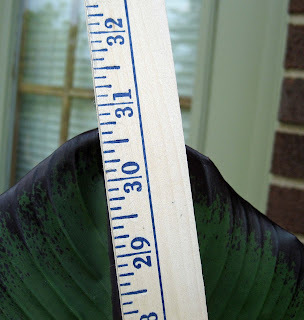 I am very proud of my colocasia right now and maybe I will measure. I have big banana leaves but they are green and they're supposed to be red, so I am angry at them. I am NOT seeing red. In this late part of the season, I think foliage is where it's at. love the biggest best banana leaves and the reddest is beautiful. awhile back i did a post on my gigantic sunflowers. "sunshine on my shoulders makes me happy" they measured over a foot wide and 10 feet tall. My biggEST leaf in the garden now is the Sum and Substance leaves. They don't compare to banana leaves though. The smallEST would be a tiny sedum I can't remember the name of right now. The brownEST part of my garden is the lawn. Which is crispy and quite dreadful looking. Redest leaf right now belongs to a Geranium maculatum that is already showing its fall color. Smallest leaf goes to Sweet Alyssum which is shriveling in the dryness. Largest leaf is paltry compared to your Banana. It's from Hosta 'Krossa Regal.' I'm going to use it anyway to make a birdbath. That Banana leaf is perfect for a leaf-casting concrete birdbath. I think we should all have a leaf-casting-athon this weekend. I'll submit my 'Citrina' daylily as the garden plant I've had in my possession the longEST, Carol - since 1978. The oldEST plant is not in the garden proper, since it's a houseplant. That Jade Plant has been with me since 1973. Don't you just love the look of the rolled-up leaves on the banana? Mine has green leaves and I like it, but those red leaves are way cool. Well in my garden right now, i guess its a tie for wettest plant.. the rain keeps pooring down. What a fantastically beautiful leaf! I love that last photo of it. MMD is so right, what a leaf casting that would make. I had been using the eight ball squash leaves for castings, they are an interesting shape and large, but I pulled out the mildewed plants last week, but will miss the eight balls. Next year, because of you, it will be cue balls! Does aphidEST count? I have a honey suckle with the most aphids I've ever seen! How exciting. I love it. What an accomplishment. Very impressive. All I have is messiest. I used to have Colocasia gigantea Thailand Giant Strain that I bought from Plant Delights. Now that monster had giant leaves! That is a big leaf! We have some banana tree's too. I just don't like having to bring them in every year. love your red banana leaf! do you bring it inside in the winter? I'm with Anthony on the crappy-est summer veggie garden ever. And I'm also with you on the lack of mulch and plethora of weeds... so I think that's a strikeout for me! But I love your red banana leaves. I can't believe how nice they look, too--the ones at the garden center get ratty with wind, and that's kept me from trying them in my garden.